The fixing of minimum support price (MSP) of wheat at Rs 1,285 per quintal has caused considerable resentment among farmers. Even Chief Minister Parkash Singh Badal has strongly disapproved the wheat MSP, terming it as a “shocker” for farmers. Earlier, the farmers had protested when the Centre announced Rs 1,110 per quintal as the MSP of paddy (grade A) in June this year. Punjab will host the second World Kabaddi Championship from November 1. The Punjab and Haryana High Court has minced no words to say finance companies are still employing recovery or collection agents, and using aggressive methods, despite Supreme Court observations against the practice. Punjab Pradesh Congress Committee (PPCC) president Capt Amarinder Singh has categorically said the Punjab Bachao Yatra is being organised by the state Congress and will be led by him in coordination with party’s state affairs incharge Gulchain Singh Charak. It is not only crime, which has come down in 2010-11 in Punjab, the state police has also been successful in substantially reducing the number of absconders during this period. The number of proclaimed offenders (POs) has also come down. After 15 days’ pen-down strike by the contractual staff working under the Sarv Sikhiya Abhiyan (SSA), the Director General of School Education, Punjab, Baldeo Purushartha, has finally called the core committee members of the union for a table talk on November 3. In the wake of this meeting, this strike has been postponed till then. Army units at Fazilka celebrated the raising day of the Infantry, known as the “queen of the wars” in Army parlance, at a 1971 Indo-Pak war memorial at Asafwala village near here. 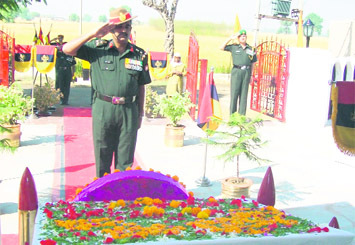 Army Commander Brig Arul Dennis and other senior Army officers laid wreath at the memorial and saluted the martyrs as contingents of Army jawans sounded the last post. The Doctors Federation of India (the Docsfed India) has stated that the state departments of Local Bodies and the Health and Family Welfare are responsible for the endemic of dengue fever in certain districts of the state. It has sought a high-level inquiry into the malfunctioning of these departments and dereliction of duty in checking the spread of the disease. The CBI today raided the houses of SS Vashisht, purchase officer, Cotton Corporation of India (CCI), at Sukhadia Nagar, Sriganganagar, and Jaipur. The 12-member team, led by inspector RS Shekhawat, was told that Vashisth, presently posted at Hanumangarh, was away to Chandigarh for official work. Efforts to get him back for questioning could not succeed. Kuldeep Singh Bachre, a key witness in the murder of human rights activist Jaswant Singh Khalra, died of heart failure last night at his native village Bachre, 4 km from here. The city police has lodged a report under Section 174 CrPC. The postmortem was conducted at the local Civil Hospital by a team of three doctors, said the SSP Manminder Singh. As per the report lodged with the police, Kuldeep complained of some uneasiness at about 9 pm. Kanwaljit Kaur, Kuldeep’s wife, sought the help of the CRPF personnel deputed for his security to take him to the Civil Hospital where doctors declared him brought him dead. Post-Diwali the agencies in Patiala have procured a little over 8.30 lakh metric tonnes of paddy in all the markets here. Though lifting is still on the slower side, the arriving paddy is low on moisture making things easier for the procurement agencies. Punjab’s former Additional Advocate-General Harpreet Sandhu’s book “Indo-European Legal System - A Comparative Study” has been placed in the Trinity Hall, Cambridge University library, as a valuable edition. A youth set a teenaged girl, who had spurned him, on fire in Kotsukhia village of Faridkot today morning. With over 80 per cent burns, the condition of the girl, admitted in the Guru Gobind Singh Medical College and Hospital in Faridkot, is reported to be critical. A 52-year old patwari, dismissed from service, has allegedly been found murdered on a roadside at Data village in Moga district. His dead body was recovered by the police and sent to the district hospital for a post-mortem examination, which would be conducted on Friday. As per the details available, the retired revenue employee Baldev Singh went out from his home last night to light-up a ‘diya’ at the ‘memorial’ of Baba Kala Mehar situated on the outskirts of the village but did not return home. The Patiala police has registered a case pertaining to cheating against Darshan Singh, a constable with the Indian Reserve Battalion band staff, who allegedly used fake certificates to procure his job. The fixing of minimum support price (MSP) of wheat at Rs 1,285 per quintal has caused considerable resentment among farmers. Even Chief Minister Parkash Singh Badal has strongly disapproved the wheat MSP, terming it as a “shocker” for farmers. Earlier, the farmers had protested when the Centre announced Rs 1,110 per quintal as the MSP of paddy (grade A) in June this year. The state government had urged the Centre to fix the wheat MSP at Rs 1,800 per quintal. Is the growing of paddy and wheat remunerative for farmers taking into account the existing MSP of both crops? The straight answer is: It is not remunerative to grow paddy and wheat, especially for small and marginal farmers, if one is to include family labour and the rental value (per annum) of the land in the overall production cost of both the crops. “However, if the family labour and rental value is excluded, then it is remunerative to the extent that a small farmer family can merely survive on it, but still cannot think of a decent living,” said Balwinder Singh Sidhu, Director, Agriculture, adding that the family could not meet its social needs such as spending on children’s education, marriages and other social obligations. “That is why almost all small and marginal farmers are under debt in the state”. Earlier, in consultation with the Punjab Agricultural University (PAU), the Agriculture Department had pegged the cost of production of paddy for the current fiscal year at Rs 1,500 per quintal. It included the rental value of land and family labour, besides a margin of 20 per cent. However, the MSP announced was Rs 1,110 per quintal. 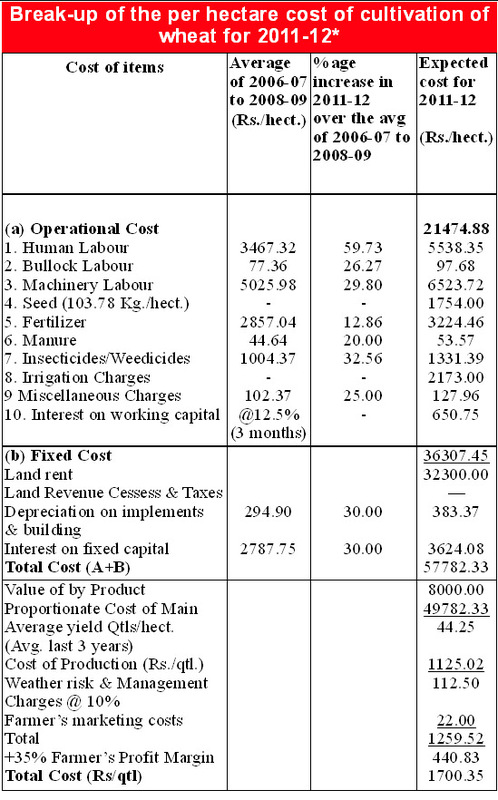 Both PAU and the department officials worked out the cost of production by using a scientific method to obviously avoid facing any embarrassment while presenting the document to the Commission for Agriculture Costs and Prices, an organisation given the task to recommend the MSP of various crops to the Central Government before it is approved by the Union Cabinet. The cost of production of wheat was worked out at Rs 1,700 per quintal for the current fiscal year. However, the MSP has been pegged at Rs 1,285 per quintal. Moreover, the Bharti Kisan Union (Rajewal) had calculated the production cost of wheat at Rs 2,909 per quintal (including 15 per cent profit for farmers) and of paddy at Rs 2,295 per quintal. Balbir Singh Rajewal, BKU president, had also submitted a memorandum to Union Agriculture Minister Sharad Pawar and the CACP in this regard. 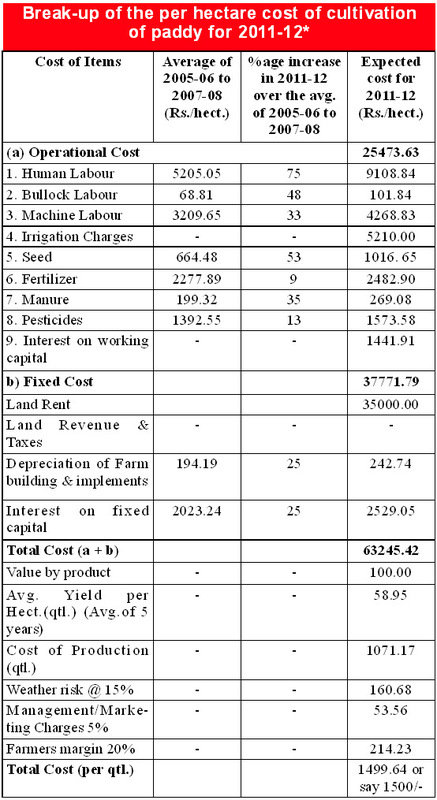 However, in case, the rental value and family labour is excluded from the cost of production, there can be a net return in the range of Rs 20,000 per acre for growing paddy and about Rs 17,500 per acre for wheat at the existing MSP. This figure has also been worked out by a state government organisation. That means, a farmer owning 5 acres can earn about Rs 1,87,500 from paddy and wheat crop cycle in a year. Again, the sum is hardly sufficient for a farmer family of five members to have a decent living. If one divides Rs 1,87,500 by 365, the daily income of the family comes to a little more than Rs 100 per head per day, less than the daily wage of a casual labourer. For farmers owning land above 10 acres, farming is viable to some extent and for big farmers owning land in the range of 50 acres or above, it is a remunerative profession. Dr MS Sidhu and Dr Sukhpal Singh, both senior economists of the PAU, said without financial support from other sources, life for small and marginal farmers would continue to be stressful. Dr Sukhpal Singh said during the past some years, about two lakh small and marginal farmers had moved out of the farming sector. Punjab will host the second World Kabaddi Championship from November 1. Bollywood icon Shahrukh Khan will be the brand ambassador of the event and will participate in the inauguration to be held at Bathinda. Thirteen countries will be participating in the event; while three countries will also have women teams participating in the event. Interestingly, the date coincides with the launch of the Punjab Bachao Yatra of the Congress, led by Congress president Amarinder Singh. While the Congress will be busy motivating people through rallies to vote for it, the SAD-BJP leadership will be spending most of its time watching kabaddi. Giving out the details of the event, Deputy Chief Minister Sukhbir Singh Badal, who is also the chairman of the championship committee, said that it is for the first time that countries like Sri Lanka, Nepal, Afghanistan and Argentina that are non-kabaddi playing nations will also participate in the world cup. The Punjab Government has proposed a budget of around Rs 16 core. Out of this budget, around Rs 10 crore has been raised through sponsorships. “It is not a question of money; see how the SAD government has turned a rural Punjab sport into an international event. Turkmenistan, Canada and USA are sending women teams. We hope to get a very popular Bollywood actress for the closing function at Ludhiana”, he said hinting that it could be Kartina Kaif. Punjab claims to be the only state in the country that has formulated a sports policy. Highlighting this Sukhbir said that the other states as well as the Centre needs to emulate Punjab’s sports policy to popularise sports in the country. The world cup would be held during the day across different stadiums in Punjab and at night under a flood-lit arena in half a dozen sports complexes that have the provision for it. 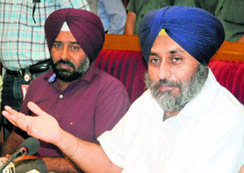 Sukhbir said that about 19 countries had shown a keen interest in participating in the world cup. However, due to administrative reasons only 13 could be accommodated. The opening and closing ceremonies will be of two hours and one and a half hours, respectively, and are being organised by Wiz Craft, an event management company that handled the Commonwealth Games. Director Sports, Pargat Singh, disclosed that the Punjab government had banned 20 Punjab players from playing kabaddi for the next two years after they had tested positive for a banned substance. India will pick up its team from among 31 players, a majority of whom are from Punjab and the region. The matches would be organised at Bathinda, Faridkot, Gurdaspur, Dhudike (Moga), Roopnagar, Sangrur, Chohla Sahib (Tarntaran), YPS Patiala, Kapurthala, Doda (Muktsar), Amritsar, Ferozepur, Hoshiarpur, Mansa, Jalandhar, Bathinda and Ludhiana. The 13 countries for men’s kabaddi and three for women’s kabaddi will vie for the Rs 4.11-crore prize money. Prize money has been doubled to Rs 2 crore for the winner. Sri Lanka, Nepal, Afghanistan and Argentina, that are non-kabaddi playing nations, will also participate in the world cup. 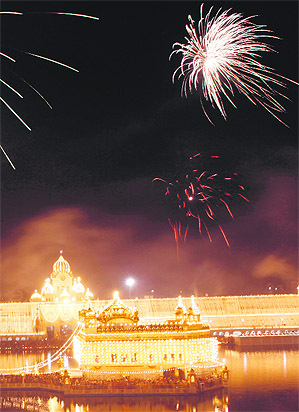 In a measure aimed at protecting the Golden Temple, the SGPC on Wednesday reduced the duration of fireworks to celebrate Bandhi Chhod Diwas and Diwali to 15 minutes. This was half the time compared to previous years. 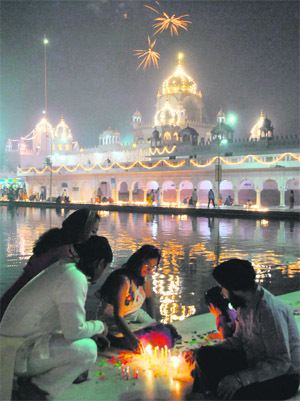 This is for the first time that the SGPC slashed the time of fireworks to minimise the threat of pollution to the shrine. “While we are taking measures to reduce the threat of pollution to the Golden Temple, residents continue to burn firecrackers around the shrine. There should be a check on this as it also adds to the pollution in the area,” he added. Earlier on Wednesday, in his address to the Sikh community, Akal Takht Jathedar Giani Gurbachan Singh stressed the need to uphold the utmost respect for the Sri Guru Granth Sahib. He said repeated instances of sacrilege of the holy book were a serious challenge for the community. He said such incidents were taking place due to the negligence by gurdwara committees, adding that it should be ensured that those heading these committees are baptised Sikhs. Deprecating the conduct of a Chennai-based finance company, Sundaram Finance Limited, Justice Ranjit Singh has added that recovery or collection agents is rather a dignified term for individuals and “independent contractors hired by the banks and the finance companies to detect defaulters and then torture them physically, mentally and emotionally to force them for clearing their dues”. “Despite some telling observations made by the Supreme Court in regard to the mode adopted by the banks or finance companies to employ recovery/collecting agents, who use aggressive manners and make the people taking credit a victim, the mode as adopted continues to be employed by the finance companies like the petitioner. As observed by the Supreme Court, the banks are the aggressors and the public is a victim”. Justice Ranjit Singh also quoted the Supreme Court as saying “a man's self-respect, stature in society are all immaterial to the agents, who are only primed at recovery. Using abusive language for recovery is noticed to be the norm of the day for most banks and such institutions”. Justice Ranjit Singh asserted: “The Supreme Court has directed that the banks should resort to the procedure recognised by law to take possession of the vehicle in cases where borrowers may have committed default in payment of instalments instead of taking resort to strong-arm tactics”. “This is what has clearly happened in the present case, as has been revealed from the facts. At least, the conduct of the petitioner finance company needs to be deprecated”. The observations came on three petitions filed by Sundaram Finance Limited for quashing of a criminal complaint and order dated October 20, 2007, summoning the petitioner-company along with three co-accused for offences under Sections 379, 323 and 506 of the IPC. The complainant had approached the company’s Ludhiana branch for a loan to purchase Bajaj Tempo Trax. A loan of Rs 2.7 lakh was advanced to Rohit Kumar for the purchase of the vehicle while Raj Kumar was the guarantor. The complainants had claimed the accused, along with four-five persons, forcibly snatched the vehicle keys and took it away. Dismissing the petition, Justice Ranjit Singh observed: "The accused-petitioners are alleged to have prepared fake documents to cause the sale of the vehicle at a very low price and, thus, had filed this complaint against the petitioners”. Referring to the reports in certain sections of the media quoting some anonymous leaders and unconfirmed sources that the party high command had not nominated any particular leader and it would be a collective effort, the PPCC president made it clear that the programme had been chalked out in due consultation with the party incharge and he along with Charak would be leading the yatra and addressing public meetings across the state. According to Punjab police figures, the number of absconders in the state has gone down from 20,238 as on June 2010 to 18,581 as on June 2011. A reduction of 1,657 was achieved despite an addition of 1,971 absconders during this period. The police was able to arrest 3,409 absconders in the one-year period. The number of POs has been brought down from 6,556 to 6,337 during one year. As many as 622 proclaimed offenders were added to the list while the names of 841 were deleted. Both comparisons were done at the fag end of former DGP PS Gill’s tenure and are largely seen as an initiative taken on the directions of Deputy Chief Minister Sukhbir Singh Badal. Among the three Commissionerates of Amritsar, Jalandhar and Ludhiana, the Commissionerate of Jalandhar has been successful in bringing down the number of absconders in its area by 289 persons. It brought down the number of absconders from 2,742 as on June 2010 to 2,453 as on June this year. As many as 804 absconders were arrested in the Jalandhar Commissionerate during this period while 515 persons were added to this list. The Amritsar and Ludhiana Commissionerates brought down the number of absconders by 67 and 10 persons, respectively, even as 80 and 118 persons were added to this list in the one-year period. Both commissionerates affected 147 and 108 arrests, respectively. As far as the border range of Amritsar rural, Tarn Taran, Gurdaspur and Batala is concerned, the number of absconders has been brought down by 233 persons. Amritsar rural alone brought down this figure by 106 persons. The Jalandhar range has brought down the number of absconders by 293 persons with Jalandhar rural alone accounting for 210 persons. In case of the Patiala range, the number of absconders was reduced by 87. Patiala district, which had 516 absconders on its list in June 2010 and witnessed an addition of 82 persons during the one-year comparison period, saw 107 absconders being arrested. In case of the Ludhiana range, the number of absconders has reduced by 110 during the one-year period. The Ludhiana rural and Khanna police affected 121 and 110 arrests during this period even as 115 absconders were added to their lists during this period. There were two major fire incidents in the city. In the first incident, a medical store at Devigarh road caught fire. By the time the fire brigade reached the spot, fire had engulfed the entire store. It took firemen an hour to tackle the fire. 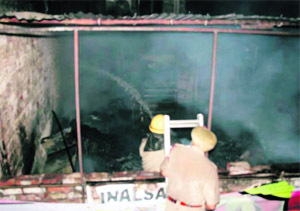 The owner claimed that goods worth lakhs had been gutted. The second major fire broke out on the third floor of a crockery shop in Tripri. The fire team used the roofs of nearby shops to access the shop and were eventually successful in preventing the fire from spreading. In the Mahavir area, a plastic drum lying in a godown caught fire after a lit cracker fell into the drum. The fire brigade was able to handled the situation in time. The roofs of a few shops near the Mata Kaushalya House also caught fire, but again, the fire brigade managed to reach the spot on time and prevent any loss to property. There was some loss to property in fire incidents at Jassowal village, in locked house at the Karah Wala Chowk and another house in Jujhar Nagar due to minor fire incidents. Another fire broke at the Gher Sodian area at the rear of the Adaalat Bazaar, but residents of the area helped the fire team and a tragedy was avoided. Talking to The Tribune, chief fire officer Jatinderpal Singh said it had been a hectic night for the fire brigade team with as many as 11 fire incidents occuring on Diwali night. “Three fire brigade vans were on duty during the night and fire incidents were being reported until 4 am. Our fire brigade team comprising Raman Vishal, Amarjit Singh, Gurcharan Singh, Lakshman Das,Ravinder Singh and me had a tough time dealing with it. But we succeeded in preventing any major loss to life and property,” he added. Sources said the DGSE had assured them that he would also arrange a meeting with Chief Minister Parkash Singh Badal in this regard. One of the union members said the DGSE had terminated 56 members working at the state headquarters of the SSA and in the wake of this termination, the union members from various districts had called for a state-level dharna outside the DGSE office last Friday. Keeping in view this call, the DGSE revoked the terminated employees and also invited them for a table talk on November 3. Therefore, the union had decided to postpone the strike till then, he added. “Though nothing much was said about the regularisation of our services, the DGSE has assured us that they would certainly take some decision over the salary hike issue. He said the file would be forwarded on November 3 and a meeting with the CM would be scheduled after one week,” said another member. Though these employees have been working for over 7 years now, they have not been regularised. Meanwhile, the SSA/RMSA/CSS Teachers Union will meet the Chief Minister on October 31 for regularisation of their services. Addressing the gathering, Brigadier Dennis recalled the supreme sacrifices of the Army, particularly the Infantry, which led man-to-man battles in 1965 and 1971 Indo-Pak wars. He said Pakistan had worked out a strategy to capture a large portion of Punjab starting from Fazilka, but the brave jawans of the 4 Jat, 15 Rajput and 3 Assam Regiments repulsed the attack. As many as 283 officers and jawans had sacrificed their lives in the Fazilka sector. He said out of the total 20 Param Vir Chakras, 17 had been awarded to soldiers of the Infantry and 26 out of 28 Ashok Chakras had also gone to the Infantry. The Commander also lauded the efforts of residents of Fazilka in raising a magnificent memorial as a tribute to the martyrs of the 1971 Indo-Pak war. Members of the Shaheedon Ki Samadhi Committee managing the war memorial and others also paid tributes to the martyrs. President of the Docsfed India Dr DC Sharma alleged that there was no coordination between the two departments, the Local Bodies being responsible for the sanitation and fogging of anti-mosquito insecticides in the urban areas, while the Health Department for anti-larva measures and the treatment part. "There were just 27 cases of dengue reported in 2007, which touched the figure of 4,349 in 2008, it came down to 245 in 2009 and again shot up to 4,012 in 2010. Till October 24 this year, 2,534 suspected cases of dengue have been reported from the state and if the current trend continues, the figure may surpass the 2008 figure," said Dr Sharma. He said it was astonishing that dengue had engulfed chiefly three districts of Muktsar, Ludhiana and Bathinda, with the VVIP’s having their constituencies in these districts. These 3 districts collectively count for 1,933 suspected dengue cases out of the 2,534 total suspected cases reported from this area so far, he added. He alleged that despite early warnings issued in June, the concerned departments failed miserably to react. Sources confirmed that besides seizing some documents, his bank accounts and lockers had been sealed. The CBI team also carried search at CCI office in Hanumangarh before leaving for Jaipur last night. The sources said Vashisht had come under the scanner when he contested the election for the CCI Employees Federation. He is believed to have spent huge money on campaigning. His name also figured in complaints relating to some land deals, the sources added. Meanwhile, the Anti-Corruption Bureau teams, which had arrested income tax officers KR Verma and HK Phulwaria in bribery cases, have completed the search of bank lockers rented by these officers. Currency notes, fixed deposit receipts and documents related to 60 bighas of agricultural land besides urban property had been recovered. Kuldeep Singh Bachre, a key witness in the murder of human rights activist Jaswant Singh Khalra, died of heart failure last night at his native village Bachre, 4 km from here. The city police has lodged a report under Section 174 CrPC. The postmortem was conducted at the local Civil Hospital by a team of three doctors, said the SSP Manminder Singh. As per the report lodged with the police, Kuldeep complained of some uneasiness at about 9 pm. Kanwaljit Kaur, Kuldeep’s wife, sought the help of the CRPF personnel deputed for his security to take him to the Civil Hospital where doctors declared him brought him dead. The body was cremated today. His funeral was attended by a large number of residents. Paramjit Kaur, patron of the Khalra Mission Organisation, and Sardool Singh, the deceased’s uncle, have ruled out any foul play. Kuldeep was an SPO in the Punjab police when Khalra was allegedly abducted by the police and was later killed. Kuldeep was the personal gunman of the then SHO, Chabal, Satnam Singh, who was among the five policemen convicted by a CBI court. The conviction was also upheld by the Punjab and Haryana High Court. 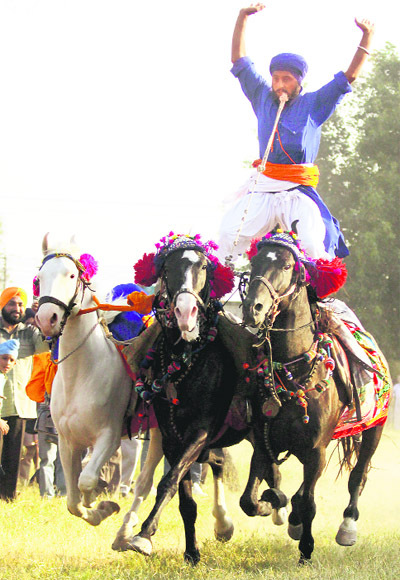 The others are Jaspal Singh (DSP), Surinderpal, Jasbir Singh and Pritpal Singh. Kuldeep had testified the torture of Khalra during his days in illegal custody of the Punjab police. Khalra was allegedly murdered by the police as he had exposed the systematic and widespread practice of enforced disappearances, fake encounters, custodial murders and torture by the Punjab police during the mid-1980s to the mid-1990s. After an initial delay following internal differences between the government agencies, paddy procurement has picked up pace. The five major state government agencies, including Pungrain, Markfed, Punsup, Warehouse and Punjab Agro, apart from private millers, have procured over 8.30 lakh metric tonnes of paddy in Patiala, Rajpura, Samana, Patran, Nabha. Farmers claimed that with majority of the procurement over in the mandis, things are getting easier with them able to sell their produce in two to three days. “I came here on Monday and happily, I was totally free on Diwali morning,” claimed Harjinder Singh, a farmer from Nabha. “Despite lifting of the procured paddy being slow and the space crunch, the procurement is smooth,” claimed Gagandeep Singh, who accompanied his father in the Patiala grain market. The book is based on both his personal experience of visiting the courts in Europe during the past two years and subsequent studies comparing the legal system of the two countries. Sandhu was initially invited by the Swiss Federal Supreme Court at Lausanne for release of the first edition of the book on June 30. On July 4, the book was launched and presented at the Supreme Court - Cour de Cassation, Paris, France. The book was also presented at the UIA Head Quarters in Paris. It was then launched by Jenny Rowe, Chief Executive, United Kingdom Supreme Court at England. The book was also presented to John Wotton, President of The Law Society, at the office of the Law Society of England and Wales. The book was also at the office of International Bar Association, England. It was also presented to the Member of Parliament for Ealing at the House of Commons, London. The police have registered an attempt to murder case against Hoshiar Singh, the accused youth in the village. The victim’s family members told the police that the youth had been stalking her for the last many months but she had spurned his advances which left him infuriated and he took the extreme step. Today morning at around 9 am, when the father of the girl had already left the house for his work and the girl was in the house with her two sisters, the accused reached the girl’s house with a bottle of kerosene, poured it over her and lit a match. He then fled the spot. “Minutes after I left home for my work, I got the information that a youth had poured kerosene oil on my daughter and set her on fire”, said the father of the victim. The girl received 80 per cent burns and was rushed to the Civil Hospital, Kotkapura, but for her condition being highly critical, she was further referred to Guru Gobind Singh Medical College, Faridkot. The police said that they were trying to record the victim’s statement. No arrests have been made so far. Preliminary investigations revealed that he was drunk. Moreover, the followers of Baba Kala Mehar offer drinks at the memorial, which leads to the doubt that he would have taken few drinks, which can only be established only after the post-mortem examination report. The SSP Sneh Deep Sharma said that the police has registered a criminal case of murder against five persons identified as Manpreet Singh, Gurpreet Singh, Mangal Singh, Sukhdev Singh and Makhan Singh, all residents of the same village. The SI Bikkar Singh, who is investigating this case, said that Harpreet Kaur the daughter of the deceased had alleged that her father was murdered by the said persons due to personal enmity. Adding that none of the alleged accused persons had been arrested by the police as yet, the SI said that the police was waiting for the post-mortem examination report after which a proper investigation would be conducted based on the nature of injuries. Meanwhile, there was also a theory that the deceased could have been hit by some motor vehicle being in a drunken state, which could have led to his death. But, the family members of the deceased did not digest this theory of death contending that Baldev Singh was getting repeated threats to his life for the past many months from the persons named in the first information report. “I am of the firm opinion that my father has been murdered by these persons and police should arrest all of them immediately”, said the daughter of the deceased man. According to the FIR, the accused, employed with the band staff, had used fake educational certificates to get employment. After a formal complaint was made, a police inquiry proved that he was guilty of forging documents. “We are yet to arrest the accused,” said the police.